PM Netanyahu is on a three-day visit to Britain and France – whose leaders are now said to be threatening to recognize a Palestinian state. Prime Minister Benyamin Netanyahu is paying an official, three-day visit to Britain and France – whose leaders are now said to be threatening to recognize a Palestinian state. 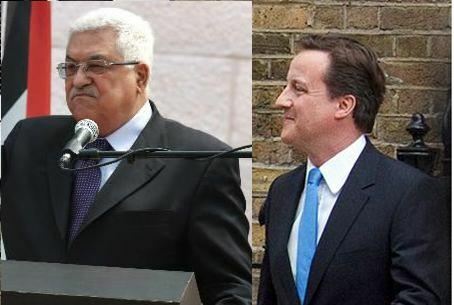 Palestine, of course, does not exist – the Oslo Accords recognize the Palestinian Authority – but this “slip” was apparently a harbinger of true British intentions to recognize a unilaterally-declared Palestinian state this coming September. Netanyahu has long called for direct talks with the PA, which has refused to agree unless Israel formally stops all construction in Judea and Samaria – a step that Israel took for ten months without any significant move to talk on Abbas' part, and which it largely continues to implement de-facto. French leaders are also expected to make a similar recognition threat to Netanyahu. Prior to his meeting with the British leader, Netanyahu told reporters in London that the Fatah-Hamas agreement signed in Cairo was a “tremendous blow to peace and a great victory for terrorism. Three days ago, terrorism was dealt a resounding defeat with the elimination of Osama bin Laden; today, in Cairo, it had a victory." As Netanyahu noted, Hamas condemned the United States for its killing of arch-terrorist Bin Laden. He said that PA chief Mahmoud Abbas, in signing the unity agreement with Hamas, had "embraced" an organization that condemned the American operation against Bin Laden and called him a "great martyr." "When he [Abbas] embraces this organization, which is committed to Israel's destruction and fires rockets on our cities, this is a tremendous setback for peace and a great advancement for terror,” Netanyahu said. “What we hope will happen is that we find peace - and the only way we can make peace is with our neighbors who want peace. Those who want to eliminate us, those who practice terror, are not partners for peace."